The reason that it’s often hard to evaluate higher proof spirits vs. wine is that when alcohol evaporates, the fumes tend to overpower the subtle esters that contribute the aromas inherent in the spirit. Time spent reposing in wood barrels contributes spicy notes, vanilla and caramel characteristics and even fruity aromas to good whiskeys, but if the heat of the evaporating vapor snaps your head back, it’s easy to miss out on the subtleties. The NEAT Ultimate Spirits Glass is the solution to this problem, thanks to its unique design that intentionally traps the harsh alcohol vapors in the middle of the bottom of the glass and then releases them over the flared sides of the glass. This allows the alcohol-free aromas to concentrate over the center of the glass where your nose can better distinguish them. Professional spirits judges recognize how important that the nose of a liquor is to the entire experience, and aroma is a major component of taste. The squat design of the NEAT glass allows for easy swirling to release these aromas, and it is very easy to warm the glass in your palm. Compare the NEAT glass to other traditional snifters and glasses and you can see how innovative the design really is. Tulip glasses and snifters actually concentrate the alcohol vapors, and the narrow openings force drinkers to put their noses exactly where all the heat is, if they can actually smell anything at all after their nostril hairs have been singed by the ethanol. I tested out my sample NEAT glass with one of my favorite everyday (well, every night) bourbons. I had always considered it to be an uncomplicated spirit, with a smooth character and a short finish of the traditional vanilla and caramel. But in the NEAT glass, a whole new world of characteristics were exposed in this fairly pedestrian bourbon. I immediately detected citrus notes on the nose and a strong aroma of ripe bananas. Totally unexpected, these elements were pretty delightful, and were probably already evident to a more talented palate than mine. But I imagine they would be overlooked by most drinkers thanks to the abrupt short finish of the whiskey. You can also drink out of the NEAT glass, but don’t expect to use it as a shot glass. Used properly, you should only fill the glass up to the widest part of the bell of the glass, less than an ounce. By design, the NEAT glass fans the spirit out across the width of your tongue as opposed to a traditional straight-edged shot glass, which deposits it to the center of your tongue where it misses out on a lot of flavor receptors. If you take a big swig, the spirit probably misses your tongue completely, so you’re just trying to achieve the desired effect without the delight of actually tasting the craftsmanship of the distiller. If that’s what you want, more power to you. But the NEAT glass is not for power drinkers. It’s for people who want to appreciate the botanicals of a nice gin or the result of years of oak on an aged whiskey of Scotch. 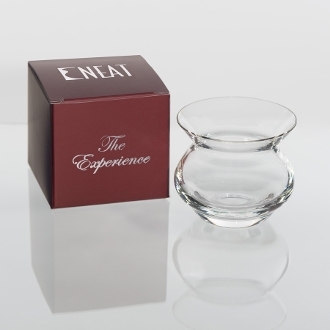 At $19.95 from the company’s website or from many online merchants, the NEAT glass would make a wonderful gift for anyone who appreciates fine spirits. In your own home bar, the amount of extra enjoyment achieved from discovering new things about your old favorites is priceless. Pros use the NEAT Ultimate Spirits Glass when they judge at international competitions, and now you can have the same equipment at home. The company hopes to bring a new edition of the NEAT glass out soon after moving manufacturing to the United States. But personally, I wouldn’t wait for it. You can always buy another one later to share with your friends. The NEAT Ultimate Spirits Glass is available from the company website and other major online retailers like Amazon. What I Liked: Makes old favorite spirits new again by introducing your nose to a world of new aromas, thanks to the inventive design of the glass. What Needs Improvement: A larger, snifter-sized version of the NEAT glass might be nice for a full snootful of cognac after dinner.